This dish came about when I was wondering what I could put into a jacket potato to make it more interesting and I opened the freezer and spotted a haggis. Haggis may not be everyone’s cup of tea, but really, it’s no worse than eating a sausage – and what’s more, it’s delicious! Pre-heat the oven to 200°C. Bake the potatoes for about an hour or until tender, then remove from the oven and leave to cool a little. 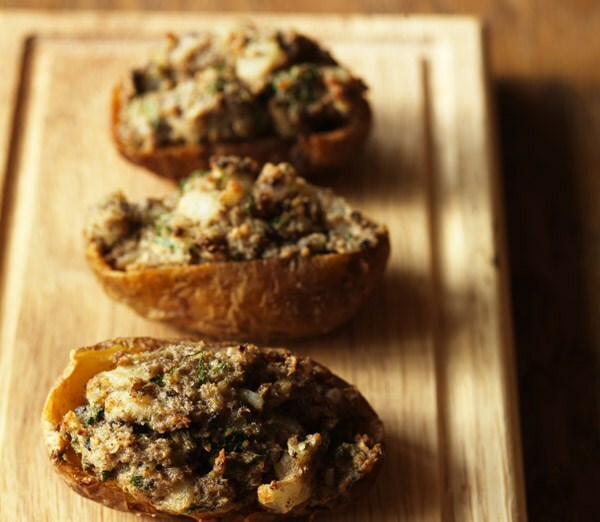 Cut the top off the potatoes and scoop out the potato and mix in a bowl with the haggis and butter. Refill the skins, discarding the top bit that you have already cut off. Mix the breadcrumbs and butter together and scatter over the potatoes. Return to the oven and bake for about 10-15 minutes before serving. This entry was posted on January 25, 2011 at 6:20 am and is filed under Food with tags baked potatoes, breadcrumbs, burns night, butter, freshly ground black pepper, haggis, recipe, salt. You can follow any responses to this entry through the RSS 2.0 feed. You can leave a response, or trackback from your own site.